Learn how to make my ultimate cheesecake recipes. 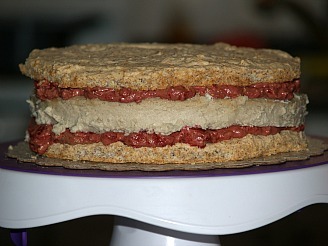 I have been searching for years through all my cooking boxes for this one special cake. I have collected recipes throughout my entire life. I have boxes of pieces of paper containing recipes for everything imaginable. All my family, friends, neighbors and acquaintances have all sent them to me from time to time. I always wanted to organize my recipes some way and this website has offered me this opportunity to do so. In the midst of all my valuable scraps of paper I decided to search for and learn how to make my ultimate cheesecake recipe. What qualifies as “ultimate”? The first thing is it must taste exceptional. Flavor comes first. When I consume calories, it must be a memorable experience. The second requirement is it had to stand above the recipe for New York Cheesecake, Baileys, Chocolate Turtle, Amaretto, and Key Lime which are the most popular. The recipe which I have chosen and want to teach you how to make for my ultimate cheesecake recipe fills the bill on all three of these qualities. It is a raspberry Japonaise cheesecake recipe. The term “Japonais” means in “Japanese style” but this recipe is actually a French recipe. You might say a French viewed Japanese cheese cake! My ultimate cheesecake recipe combines the flavors of cream cheese, sour cream, chocolate and raspberries with the delicious flavor of Chambord black raspberry liqueur. See why I chose this taste? Now let me tell you about the “presentation and the uniqueness” of this recipe. This cheesecake is sandwiched between two layers of French almond nut meringues. But that is not all. Between these layers is a spread of chocolate and raspberries; then the entire ultimate cheesecake recipe is covered with a delicious chocolate frosting. Wouldn’t you call this an ultimate cheesecake recipe? NOTE: For this ultimate cheesecake recipe it is best to make the meringues and cheesecake on day 1 then on day 2 prepare frosting, filling and assemble. Combine together the ground nuts, cornstarch and 1 cup of sugar. In another mixing bowl beat egg whites to soft peaks gradually adding ½ cup sugar. Gently fold nut mixture into egg whites. Draw 2 nine inch circles on sheet of parchment paper to fit cookie tray. Turn paper over on cookie tray so outline is next to tray; butter top side of parchment paper. With ½ inch round pastry tip and bag pipe nut meringue and fill in the circles. With remaining meringue pipe as many strips as possible on tray. Bake in preheated oven at 275F degrees for 1 hour; remove and let dry. Increase oven temperature 350F degrees. Combine cream cheese and ¾ cup sugar in mixing bowl; blend on medium speed until smooth. Add 4 eggs one at a time beating after each; add vanilla and Chambord and mix. Pour batter into buttered and floured 9 inch (foiled wrapped) spring form pan. Place spring form pan in larger shallow pan and pour hot water in larger pan (about 1 inch). Set both pans on oven shelf and bake about 30 minutes or until pick comes out clean. Turn oven OFF and let cheesecake set in oven for 15 minutes with door slightly open. Set cheesecake out of oven and let cool to room temperature. Refrigerate until cold; remove from pan before assembling. To make a frosting beat 12 ounces cream cheese and 1 ½ cups butter until smooth. Add sour cream and 1 ½ teaspoons vanilla and blend. Pour in the melted chocolate and mix thoroughly. Spoon about 1/3 of frosting mixture into another bowl for filling. Reserve 17 nice raspberries for garnish; fold remaining berries into bowl of frosting for filling. NOTE: If frosting is too thin to pipe refrigerate a little until it firms. To assemble: Begin with one of the meringue circles; cover with ½ of the chocolate raspberry filling. 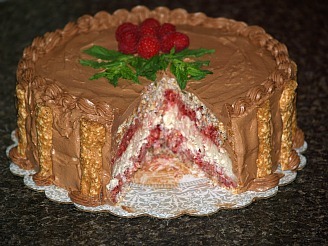 Place cold cheesecake on top of the chocolate raspberry recipe. Frost top of cheesecake with remaining chocolate raspberry recipe. Place remaining meringue circle on top. 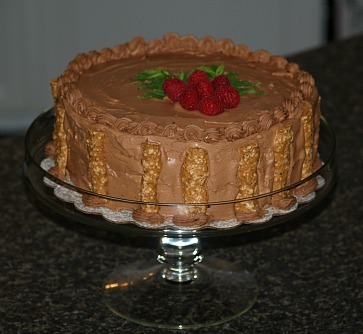 Frost entire outside of cake with the plain chocolate frosting. With a knife mark the top for 16 slices. Cut the meringue strips into lengths equal to the height of the cake; press against sides of cake. Pipe a border around the cake; pipe rosettes on each slice and one in the middle of the cake. Top each rosette with one of the fresh raspberries. Refrigerate at least a few hours before serving. Make this ultimate cheesecake recipe in shape of little gift boxes. 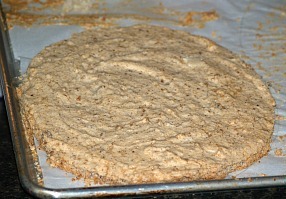 Grease 8 inch square cake pan; line bottom with wax paper and grease paper. TO MAKE CAKE beat eggs and sugar in medium bowl until thick and lemon color. Add vanilla to the bowl; sift flour over the mixture and fold in until blended. Pour into prepared pan smoothing top; bake 18 to 20 minutes until pick comes out clean. Cool cake on rack for 5 minutes; remove from pan and peel off wax paper. Cool cake completely on wire rack. TO MAKE FILLING line an 8 inch square pan with wax paper. In a small bowl combine strawberry gelatin and unflavored gelatin. Stir the boiling water into the gelatin until gelatin is dissolved. In a large bowl beat cream cheese until fluffy; beat in gelatin until blended. Refrigerate 30 minutes or until thickened. In a medium bowl beat whipping cream until soft peaks form. Beat in the powdered sugar until stiff. Spoon 2/3 CUP WHIP CREAM into pastry bag fitted with star tip; refrigerate. Fold REMAINING whipped cream into cream cheese mixture. Pour mixture into prepared pan; refrigerate 3 hour or until set. Place cold cake on a flat surface; brush top lightly with jelly. Invert strawberry cheesecake filling on top of cake; peel off paper. Trim filling making sure it is even with cake edges if necessary. Cut into 16 squares (2 inch). TO DECORATE SQUARES cut a piece of parchment paper about 17 inches square. Draw a 16 inch square on the paper with black marker; turn it over. NOTE: You should be able to see the square through the paper. Melt chocolate over very low heat in heavy saucepan stirring until smooth. Cool chocolate slightly; spread evenly inside the square on parchment paper. When chocolate is about set use a sharp knife to score 64 2 inch squares. Cool chocolate until completely set; use sharp knife to cut along scored lines. Brush each side of cheesecakes with jelly; press 4 chocolate squares on each of 4 sides. Pipe chilled whipped cream on top of each square. Place strawberry half on whipped cream; place on flat serving tray. Refrigerate until ready to serve up to 4 hours. This ultimate cheesecake recipe serves 16. For many, the ultimate cheesecake recipe must be chocolate. TO MAKE CRUST combine crumbs and butter in small bowl. TO MAKE FILLING beat cheese until fluffy in a large mixing bowl. Gradually beat in the sweetened condensed milk until smooth. Add the eggs, flour and vanilla; beat until blended. Divide batter in HALF; add melted chocolate to one half and blend well. Pour chocolate half into prepared crust; top evenly with vanilla half. Bake 50 to 55 minutes until center appears set when lightly touched. Cool completely on rack; chill until cold. Run knife around edge to loosen cake; removes sides of pan. Top cake with chocolate glaze and chill; garnish as desired. MELT CHOCOLATE and cream in small saucepan over low heat. Cook and stir until thickened and smooth; spread over cheesecake and chill.